“First Rolling Thunder Rally,” Histories of the National Mall, accessed April 22, 2019, http://mallhistory.org/items/show/203. The first Run to the Wall event, now known as Rolling Thunder, was held on Memorial Day in 1988. The rally was organized by Vietnam veteran Ray Manzo who wanted to bring national attention to the plight of prisoners of war and soldiers missing in action in Southeast Asia. 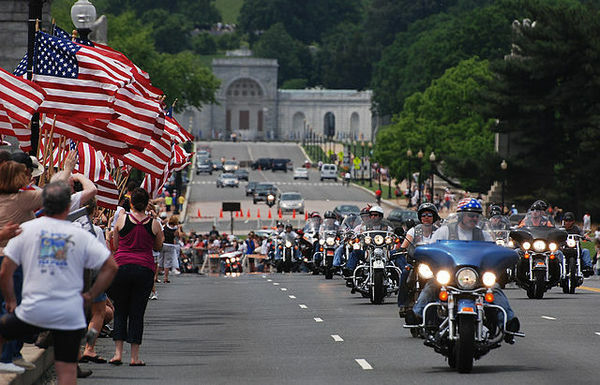 Working together with the Vietnam Veterans Motorcycle Club, Manzo encouraged many veterans and supporters to ride into Washington and gather on the Mall. Approximately 2,500 bikers participated in the first rally. Rolling Thunder continued to grow and now occurs every Memorial Day weekend. Cristiano Del Riccio. View original.